President Trump responded positively to a suggestion by a conservative reporter that social media platforms that fail to remain politically neutral should lose their privileged legal position, which affords them immunity from lawsuits for user-generated content. But the President’s own trade bill, USMCA, actually strengthens that immunity, as previously reported by Breitbart News. “We have to do something about it. It’s a very, very dangerous situation, so I agree, something has to be looked at very closely,” the President concluded in response to the Daily Caller’s question about reforming tech platform’s legal immunities. It also gives them a second legal immunity for such acts of censorship, ensuring that users will have extreme difficulty taking the tech giants to court if their content is unfairly removed. Tech platforms today are akin to a landlord who’s legally allowed to knock your house down with no notice and no compensation. But here’s the big problem for President Trump — he says he wants to tackle Big Tech bias, but his own flagship trade bill, USMCA, contains language that actually strengthens this legal immunity, giving tech platforms even more leeway to censor and imposing the same system on trade partners Mexico and Canada. Commerce Department officials say that the treaty merely ensures that U.S. platforms will not be held liable in Mexico or Canada for actions shielded by U.S. law. 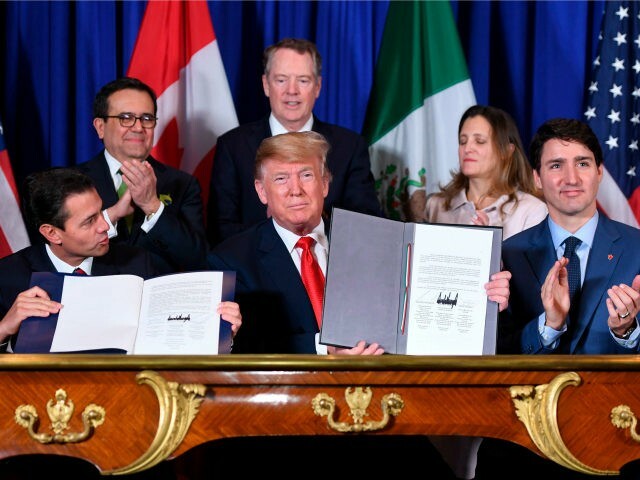 USMCA contains a modified version of the same legal immunities in Section 230. Only this time, it gives tech platforms a broad immunity to censor any material they consider “objectionable or harmful.” Thus far, some lawyers have argued that the word “objectionable” in Section 230 only applies to the preceding list of items (obscene, harassing, etc). Yet USMCA only refers to “objectionable or harmful,” thus giving tech platforms broad leeway to interpret these highly subjective terms at will. If President Trump is serious about tackling tech bias — and he sounds like he is — he should start by examining his own trade bill.